❁ Shell-pink (H16) flowers, VIII–IX; mid-green foliage; broad erect habit; height 16–20cm; spread 26–30cm. Pale mauve (H2) flowers, Jul–VIII; downy, yellow-green foliage, young shoots tipped yellow in spring; height 10–15cm; spread 31–45cm. Found in Sweden and named after the finder. Mauve (H2) flowers, XII–I, very sparse; dark green foliage; height 21–25cm; spread 31–45cm. The foliage effect is good but this has little garden value. Heliotrope (H12) flowers, VII–X, abundant and in bloom for a long period; mid-green foliage; compact, creeping, forming a cushion; height 10–15cm; spread 26–30cm. Mauve (H2) flowers, IX–X; dark green foliage, young shoots tipped cream in spring; height 16–20cm; spread 46–60cm. Named after Valerie and Brian Proudley's daughter. Mauve (H2) flowers, VIII–IX; light green foliage tinged with salmon giving an unusual and pleasing effect; semi-prostrate; height 21–25cm; spread 31–45cm. Introduced by J. W. Sparkes (Beechwood Nursery, Beoley, Redditch, Worcestershire, England). 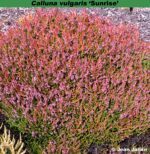 ♤ Bud-flowering (Knospenblüher), “salmon” (“a new colour in Calluna”); IX-XII; foliage green; habit upright, to 50cm tall × 50cm across after 4 years (pruned). Deliberately raised seedling, raised in September 2011, selected in September 2012. ® C.2016:04. Registered on 29th December 2016 by Johannes van Leuven (Geldern, Germany). Crimson (H13) flowers, VIII–IX; gold foliage in summer turning a deep red in winter; erect ,very compact; height 31–45cm; spread 31–45cm. Seedling; found by Mr & Mrs Hewitt (Frensham, Surrey, England) about 1982; introduced by Mr & Mrs Hewitt. Named after the finder's son. ♤ Salmon-pink buds, IX–XI; dark green foliage; erect, reasonably compact habit; height 31–45cm; spread 31–45cm. Wild-collected; found east of the Beacon of Sandhammaren, Skåne, Sweden, by Kjell-Arne Olsson (Färlöv, Sweden) in 1987; introduced by Henry Olofsson (Munkedal, Sweden) in 1995. Named after the Beacon of Sandhammaren, where it was found. White flowers, VIII–IX; mid-green foliage; dwarf; height 10–15cm; spread 31–45cm. From the cliff top near Sandwood Bay, Cape Wrath, Scotland. ♤ White buds, VIII–XI, in long spikes; yellow foliage throughout the year; height 31–45cm; spread 31–45cm. Sport from 'Melanie' found in the nursery of Marohn & Häger (Apen, Germany) in 1995. White flowers, VIII–IX; yellow foliage in spring and summer turning yellow-green in winter; height 10–15cm; spread 26–30cm. Not as tall and with larger flowers than 'David Platt'. It is named after our grand daughter, the daughter of David Platt, and was registered in November 1992. ♤ Flowers-buds white, 4mm long, 1.5mm across; IX-XI; foliage light green, in summer with light green new growth, turning light green to yellow in autumn; habit upright; height 30cm; spread 25cm after 3 years (pruned). PBR granted on 20 January 2011. Deliberately raised seedling made in October 2007 by Helmut Hiedl; selected in October 2008. ® C.2014.05: registered on 9 January 2014 by Helmut Hiedl, Altrusried-Krugzell, Germany. Deep lilac pink (H11) flowers, VIII–IX; dark green foliage; erect; height 31–45cm; spread 46–60cm. Exceptionally hardy. Seedling; raised in 1983 from a deliberate sowing, and selected by Mrs Brita Johansson (Vargön, Sweden); introduced by Arthur Persson (Tostarp, Sweden) in 1987. Crimson flowers (H13); VIII-IX; foliage green tinged gold; habit broad, upright; height 45cm; spread 45cm. Seedling; found in the garden at Scaynes Hill, West Sussex, England, before 1982 by a member of staff of Hardwicks Nurseries (Newick, Sussex, England). ♤ Greyish white buds turning pale lilac with age, IX–XI; mid-green foliage; height 26–30cm; spread 46–60cm. The German name means snow cloud. 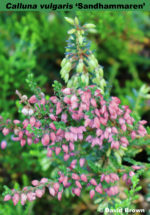 Pink (H8) flowers, VIII–X; green foliage; height 30cm; spread 40cm. ❁ Purple-red flowers, IX–X; dark green foliage; broad erect habit; height 46–60cm; spread 46–60cm. A sport from 'Peter Sparkes' found in Bad Zwischenahn, Germany. ❁ Purple-red flowers, VIII–XI; dark green foliage; broad erect habit; height 26–30cm; spread 46–60cm. A sport from 'Schurig's Sensation' found by Dietrich Scholjegerdes (Bad Zwischenahn, Germany) in 1983. Very similar to 'Annemarie'. ❁ Dark pink (H8/H14) flowers, VIII–XI; dark green foliage; height 26–30cm; spread 46–60cm. Similar to 'Peter Sparkes'. Sport on 'H. E. Beale'; found by Karl-Heinz Schurig (Barmstedt, Schleswig-Holstein, Germany) in 1967; introduced by Karl-Heinz Schurig in 1973. ❁ Pale, almost silvery flowers, VIII–XI; dark green foliage; height 26–30cm; spread 46–60cm. A sport from 'Schurig's Sensation' found by H. Hoekert (Oldebroek, Netherlands) and introduced in 1987. White flowers, with lilac (H4) tint, VIII–IX; feathery, pale lime-green foliage; height 26–30cm; spread 31–45cm. Wild-collected; found in the Aberfoyle Hills, Perthshire, Scotland, in 1967; introduced by D. Hutton (Aberfoyle, near Callander, Perthshire, Scotland) about 1974. Named after a blend of whisky. 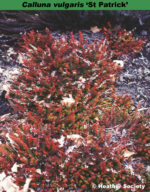 A very slow-growing, non-flowering plant, moss-like, with green foliage; height less than 10cm; spread 10–15cm. A novelty, named after a village in Czech Republic. Crimson flowers (H13), VIII–IX; orange, yellow-flecked foliage; compact habit; height 26–30cm; spread 31–45cm. A sport from 'Darkness', named after the wood behind the originating nursery in Germany. 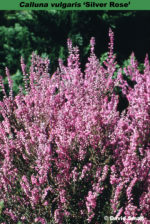 Bright mauve-pink flowers, IX–X; mid-green foliage; height 31–45cm; spread 46–60cm. Name alludes to the flowering time and flower colour. White flowers, IX–X; yellow-green foliage throughout year, with yellow shoot-tips in summer and autumn; height 26–30cm; spread 31–45cm. Sport on 'Serlei'; introduced by W. G. Slocock (Goldsworth Nursery, Woking, Surrey, England) in 1927. Name from aureus = golden yellow. See under 'Serlei'. Mauve (H2) flowers, IX–XI; mid-green foliage; very vigorous; height 75–100cm; spread 61–75cm. Sport on 'Serlei'; introduced by James Smith (Darley Dale, Derbyshire, England) by 1927. Name, see under 'Serlei'; grandiflorus = large-flowered. Maxwell & Beale (1927) placed rubra in parenthesis (serlei grandiflora (rubra)), after the name, while Maxwell (1927) gaves this as a synonym of 'Serlei Rubra'. Classified by Beijerinck as C. vulgaris var. vulgaris f. autumnalis. Purplish pink flowers, IX–X; dark green foliage; erect compact habit; height 31–45cm; spread 61–75cm. Growing at the Royal Botanic Garden, Edinburgh, Scotland, by 1938. Name Serlei is unknown; purpureus = purple. Mauve (H2) flowers, IX–X; mid-green foliage; height 31–45cm; spread 61–75cm. An excellent plant. 'A purple throw-back from ['Serlei'] ... and is only distinguishable ... by the fact that it flowers later in the season. Sport on 'Serlei'; found at Dortmund before 1918. Maxwell (1927) and Letts (1966) gave 'Serlei Grandilfora' as a synonym. Named from ruber = red. 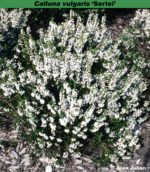 White flowers, IX–X; dense mid-green foliage; upright; height 61–75cm; spread 61–75cm. Available as early as the 1860s. Name derivation not known, but perhaps named after a person whether named Searle or Serle. No likely person has been identified. Lilac-pink (H11) flowers, VIII–IX, in narrow, erect spikes; yellow foliage in summer, turning rusty red in winter; spreading, compact; height 26–30cm; spread 31–45cm. Very hardy. Seedling; raised by Mrs Brita Johansson (Vargön, Sweden) from seed deliberately sown in 1983; this came from the same seed-lot as 'Kerstin'. The name is Swedish, and come from the Thousand and one nights' tale of Ali Baba and the 40 Thieves, "Open sesame!". Pale lilac-pink (H11) flowers, VIII–IX; tiny mid-green leaves; compact habit; height 21–25cm; spread 21–25cm. Found on Tore Mosse near Vänersborg, western Sweden, by Brita Johansson in 1985. The name is what her daughter Kerstin called herself as a child. White flowers, VIII–IX; mid-green foliage; upright, vigorous; height 31–45cm; spread 61–75cm. Flowers lavender (H3), single: VII-VIII: foliage summer yellow/ green: habit prostrate . Found growing in the centre of a pot of Calluna vulgaris 'White Lawn' but it proved impossible to determine if it was a sport or a seedling. Registered 22 September 1995: Mrs W. E. S. Bamford, Haythorne Nursery, Verwood, Dorset. White flowers, VII–IX; bright green foliage; compact spreading habit; height 10–15cm; spread 26–30cm. Its origin is not known but it probably came from a nursery in Limburg, Netherlands, before 1993. The name literally translates as silver asparagus – the region where it perhaps originated is famous for growing asparagus. ♤ Bud-flowerer, light pink; IX-XI; foliage silvery grey; habit upright; height 60cm; spread 50cm after 5 years. Chance seedling, found by Johannes van Leuven at Geldem-Lullingen in September 2007. 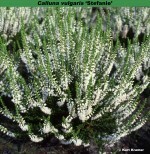 "'Silvana' is the first silver leaf bud heather." ® C.2009:09 registered on 27 November 2009 by Johannes van Leuven, Geldem-Lullingen, Germany. Pale purple flowers (H2/H10), VIII–IX; pubescent, silver-grey foliage; semi-prostrate, compact; height 10–15cm; spread 46–60cm. One of the few grey lings that does not have very drab winter foliage. Introduced by Foxhollow Heathers by 1972. Lavender flowers, VIII–IX, on long arching stems; bright silver grey foliage; open erect habit; height 31–45cm; spread 46–60cm. A seedling found near 'Silver Queen' in his nursery by John L. Jones, Glynwern Nursery, Cilcennin, Lampeter, Dyfed, Wales; introduced in 1992. White flowers, VIII–IX; downy, silver-grey foliage; upright; height 21–25cm; spread 31–45cm. Introduced by J. W. Sparkes (Beechwood Nursery, Redditch, Beoley, Worcestershire, England) by 1967. Lavender (H3) flowers, VIII–IX; downy, grey foliage, deepening in winter to purple-grey; neat, vigorous, upright habit with few side-shoots; height 31–45cm; spread 46–60cm. So named "because it stands straight up like a knight in armour". White flowers, VIII–IX; mid-green foliage, darker later; broad erect habit; height 40cm; spread 50cm. Pale amethyst (H1) flowers, VIII–IX, giving a silvery hue to the plant; mid-green foliage, shoots with brown tips; erect; height 31–45cm; spread 31–45cm. Wild-collected on Ginkelse Heide, near Arnhem, by Dr Ir T. Visser (Wageningen, Netherlands) before 1972; introduced by W. Haalboom & Zonen (Drieberg, Netherlands) in 1972. Named after the finder's daughter, Sandra. White flowers, VIII–IX, blossoms well on lateral shoots, too; mid-green foliage; spiky habit; open erect habit; height 26–30cm; spread 31–45cm. Lavender (H3) flowers, VIII–IX; downy, silver-grey foliage; spreading habit; height 16–20cm; spread 31–45cm. White flowers, VIII–IX; greyish green foliage; broad erect habit; height 30cm; spread 30cm. Found in the garden of Gerard and Jeannette Vandereyt (Heusden-Zolder, Belgium) about 1995 and named after their only child. Dark crimson-red flowers, IX–XI; dark green foliage; upright; height 31–45cm; spread 31–45cm. habit. A sport from 'Roter Oktober', with less blue in the flower colour, found by Johannes van der Schaaf (Geldern-Veert, Germany) in 1993 and introduced in 1996. Lavender flowers, VIII–IX; mid-green foliage; forms a dome shaped cushion; height 16–20cm; spread 31–45cm. A seedling found on his nursery by Nigel Sheldon, Wrenvale Nurseries, Ammanford, Dyfed, Wales, in 1993. Named in honour of the famous actor. Deep lilac-pink (H11) flowers, VIII–X; the foliage changes with the seasons: red in winter, bronze in spring, gold in summer, and shoots tipped with scarlet in autumn; broad upright habit; height 16–20cm; spread 31–45cm. Raised by J. W. Sparkes (Beechwood Nursery, Beoley, Redditch, Worcestershire, England); introduced by J. W. Sparkes in 1966. Named on the occasion of a lunch at the RHS Gardens Wisley on 30 July 1966 to celebrate Sir John's birthday. Named after the then President of The Heather Society on the occasion of his 80th birthday. Pink (H8) flowers, VIII–IX; gold foliage in summer turning a bright orange-red in winter; height 26–30cm; spread 46–60cm. Outstanding foliage plant, performing best in cold open aspects. Seedling, perhaps from 'Sir John Charrington'; found by Don Richards at Rydal Mount, Eskdale, Cumbria, England, about 1978. Introduced by Autumn 1980 by G. Yates (Ash Landing Gardens, Far Sawrey, Ambleside, Cumbria, England). A made-up name, because it was a seedling ("son") from 'Sir John Charrington' — hence the name! Mauve (H2) flowers, VIII–X; grey-green foliage in summer, turning dull bronze in winter; low spreading habit; height 10–15cm; spread 21–25cm. Wild-collected; found by Miss Anne Moseley about 1929 on The Lizard, Cornwall, England (cf. Beijerinck 1940); introduced by W. E.Th. Ingwerson (Birch Farm Nursery, Gravetye, East Grinstead, Surrey). Named after Miss Moseley; she was a nurse but the epithet "Sister" was the appellation used by her own sister. Lavender (H3) flowers, VIII–X; dark green foliage with red shoot-tips; low compact habit; height 21–25cm; spread 31–45cm. Introduced by 1973; cultivated in a nursery on The Wirral in 1973. Lilac-pink (H11) flowers, VIII–IX; mid-green foliage with some orange, red or pink shoots; erect; height 31–45cm; spread 46–60cm. Origin unknown; obtained by D. Lösch, about 1974, as a unnamed propagation of unrecorded origin from the late Hilding Nilsson (Sweden). Named and introduced in Germany but did not sell well so the name was changed to NORDLICHT by Herbert Hatje in 1981. Named after Skåne, the region of Sweden where it was obtained. White flowers; VIII-XI: habit erect. Listed by 1982; finder thought to be R. J. Brien (Pitcairngreen Heather Farm, Perthshire, Scotland). Named, perhaps after the fairy-tale character, but probably also alluding to flower colour. ❁ White flowers, VIII–IX; dark green foliage; bushy erect habit; height 31–45cm; spread 46–60cm. It is claimed to bloom two weeks earlier than 'My Dream', but is widely thought to be indistinguishable from 'My Dream' (hence the name are often regarded as synonyms). A sport from 'H. E. Beale''; found by David Ross (Brookholton Nursery, Kettleshume, Cheshire, England); introduced by D. Ross in 1984. Name alludes to the double white flowers. White flowers, VIII–IX; downy, grey-green foliage; spreading, prostrate; height 10–15cm; spread 26–30cm. 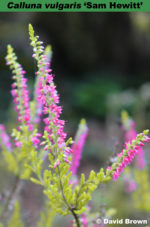 Seedling; found by Mrs D. Metheny in her garden at Seattle, Washington, USA, in 1973; introduced by Heather Acres Inc. (Elma, Washington, USA) before 1978. Mauve (H2) flowers, VII–VIII; reddish brown foliage in winter, turning brown-green with pink-red tips in spring; height 10–15cm; spread 21–25cm. Named after an island in the St Kilda group. ❁ Shell-pink (H16) flowers, VIII–X; dark green foliage; erect; height 16–20cm; spread 31–45cm. A sport from 'H. E. Beale', but being smaller the flowers appear larger. Named after the finder's daughter. Flowers white; VII-VIII; foliage yellow; height 20 cm; spread 30 cm after 3 years. Selected seedling from 'Oiseval' x 'Gold Haze', created by Kurt Kramer in 1991; selected by K. Kramer in 1993 . 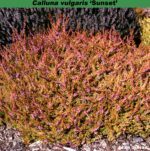 The name means "sun pygmy" referring to foliage colour and dwarf habit. ® C.2008:06 registered on 6 April 2008 by Kurt Kramer, Edewecht, Germany. 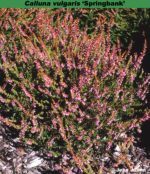 ❁ Pink flowers, VIII–X; dark green foliage turning green-brown in winter; open erect habit; height 31–45cm; spread 46–60cm. Very like 'H. E. Beale'. Found by a Mr Morgan of Sonning (Berkshire, England), before 1990; obtained from Windsor Great Park; grown at the Royal Horticultural Society's Gardens, Wisley, from 1990. Violet flowers, VIII–X; yellow foliage; compact erect habit; height 21–25cm; spread 31–45cm. Thought to be a seedling from 'Darkness' and given the nickname of finder's young son. Found by H. Hatje, Tornisch-Ahrenlohe, Germany in 1987; introduced by him in 1992. ❁ Silver-pink flowers with deep red sepals, VIII–X, 5–7mm in diameter; grey-green foliage; broad, upright habit; height 31–45cm; spread 46–60cm. Found by J. van der Lip (Hazerswoude, Holland) about 1993, named after his wife. A sport from 'Elsie Purnell'. ♤ Bud-flowering, red (H5–H6), buds small; IX-XII; foliage bright green; broad, upright habit; height 50cm; spread 50cm after 4 years. Sport on ‘Angie’ (“blooms three weeks later than 'Angie’”), found by Clemens Keysers, Kevelaer in October 2010. ® C.2011:13 registered on 25 November 2011 by J. van Leuven, Geldern-Lüllingen, Germany. 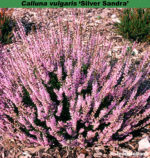 ♤ Pale pink, IX–XI; foliage bright green; habit open erect. A sport from 'Marlies', found by Johannes van Leuven; selected in October 2000. Registered on 15 December 2002 by Johannes van Leuven. Mauve (H2) flowers, VIII–IX; fluffy, orange foliage; vigorous, upright; height 31–45cm; spread 46–60cm. Mauve (H2) flowers, VIII–IX; mid-green foliage; compact; height 16–20cm; spread 31–45cm. Amethyst (H1) flowers, VIII–IX, in long, tapering spikes; pale green foliage, often tipped purple; upright; height 26–30cm; spread 31–45cm. Namesd from spicatus = bearing a spike. Loudon gave this the rank of variety. White flowers, VII–IX; mid-green foliage in summer, shoots tipped creamy white in winter becoming pronounced in spring; compact; height 16–20cm; spread 21–25cm. Mauve (H2) flowers, VIII–X; gold foliage in summer, turning orange then red in winter; bushy habit; height 10–15cm; spread 26–30cm. Similar to 'Aurea'. Seedling; found by R. E. Hardwick while he was working for Lionel Cox in his nursery at Newick, Sussex, England, about 1955. Name may be an allusion to the foliage colours. Mauve (H2) flowers, IX–XI, numerous; downy, grey foliage; erect; height 31–45cm; spread 46–60cm. Seedling; raised by Don Richards (Rydal Mount, Eskdale, Cumbria, England), perhaps from 'Ax'; introduced by G. Yates (Ash Landing Gardens, Far Sawrey, Ambleside, Cumbria) in 1980. Mauve (H2) flowers, IX–XI; dark green foliage, the new shoots pink and cream turning red later in spring; height 31–45cm; spread 46–60cm. Mauve (H2) flowers, VIII–X, mid-green foliage, shoots with pink and red tips in winter and spring, cream and pink in summer; bushy; height 31–45cm; spread 46–60cm. Lilac-pink (H11) flowers, VIII–IX; dark green foliage, shoots tipped vivid red in spring; very compact; height 21–25cm; spread 31–45cm. Wild-collected; found in Aberfoyle Slate Quarry, Perthshire, Scotland, in 1962; introduced by D. Hutton (Aberfoyle, near Callander, Perthshire, Scotland) by 1975. Named after a malt whisky. Foliage dirty green in a site facing East, where it gets morning sun only but in a position facing South, it is a bright terracotta in Spring and terracotta red in winter. The colour most noticeable in April and May. Wild-collected sport; found on Collin Mountain near Belfast, County Antrim, Northern Ireland, on St Patrick's Day 1928 by Mr and Mrs J. W. Porter (Dundonald, County Down, Northern Ireland) as a sport on basal growth of a partly burnt plant. Named after the patron saint of Ireland. Lavender flowers, VIII–IX; grey foliage; very vigorous, open, erect habit, the long shoots having numerous side-shoots towards their tips, creating the effect of antlers; height 31–45cm; spread 46–60cm. Collected by W. S. Dobson, Edinburgh, c. 1970. White flowers, IX–XI; bright green foliage; compact, upright; height 21–25cm; spread 31–45cm. Selected from seedlings of the deliberate cross between 'Hammondii' and 'Long White' made by Kurt Kramer. White flowers; IX-XI; foliage bright gren; habit compact upright; height 25cm; spread 35cm. A deliberate cross between 'Hammondii' and 'Long White'. Raised and selected by Kurt Kramer (Edewecht-Süddorf, Germany) in 1984; introduced by Kurt Kramer 1992. Fancy name, not named after anyone in particular. Mauve (H2) flowers, VIII–IX; grey-green foliage becoming silver tinted in spring; compact; height 31–45cm; spread 46–60cm. Flowers lavender with dark anthers, VIII-IX; Foliage "bronze, turning fiery-red in winter", yellow(green); colours in winter much quicker than other foliage cultivars; habit upright, to 30cm tall, to 45cm across after 3 years. 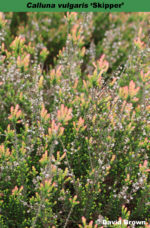 Chance seedling at Speyside Heather Centre, Dulmain Bridge, Inverness-shire; on sale in August 2004 at the Second International Heather Conference. Named: after the region in which it originated. ® C03:2004 registered November 2004 by David Lambie, Speyside Heather Centre, Dulnain Bridge, Scotland. ❁ Deep pink flowers with white centres, VII–VIII; dark green foliage; low, bushy habit; height 16–20cm; spread 26–30cm. A very attractive plant taking its name from shading of the flower. Seedling, between 'J. H. Hamilton' and 'H. E. Beale'; found at Cornish Garden Nurseries (Perranworthal, Truro, Cornwall, England) by Mr Dover about 1978; introduced by Cornish Garden Nurseries. Named from shading of the flower from near white in the centre to deep pink on the outside. Lilac-pink (H11) flowers, VIII–X, very floriferous; dark green foliage; large, dome-shaped plant; height 31–45cm; spread 61–75cm. Lavender (H3) flowers, VIII–IX; foliage rich orange-red in spring and early summer, beoming coppery orange by autumn, tipped red in winter; height 21–25cm; spread 26–30cm. ❁ White flowers, VIII–IX, in long spikes; bright green foliage; tall erect habit; height 31–45cm; spread 46–60cm. White flowers, VIII–IX; mid-green foliage with yellow-gold shoots tips in spring; moderately compact, upright growth. Chance seedling, found and selected by David Wilson in 2006 at Wilson's Nursery, Chilliwack, Canada. Registered on 29 November 2008 by Wilson's Nursery Ltd, Chilliwack, British Columbia, Canada. Mauve (H2) flowers, VIII–IX; gold foliage in summer turning orange and red in winter; height 31–45cm; spread 46–60cm. Introduced by John F. Letts (Windlesham, Surrey, England) in 1970. Lilac-pink (H11) flowers, VIII–X; gold foliage in summer, red in autumn and winter, bronzing slightly in spring; spreading; height 16–20cm; spread 31–45cm. Found by J. W. Sparkes (Beechwood Nursery, Beoley, Redditch, Worcestershire, England); introduced by J. W. Sparkes in 1963. White flowers, VIII–IX; lime-green foliage in summer, turning green-yellow in winter and spring; upright, untidy unless trimmed; height 16–20cm; spread 46–60cm. 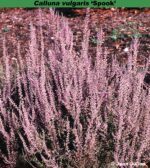 ♤ Bud-bloomer; lilac (H2); September-November; foliage dark green; habit broad, upright.